During the next 15 minutes, Beth outlined the idea, offered supporting evidence and very clearly articulated how the new proposal extended the firm’s strategy and solved problems for customers. Heads nodded, and as Beth scanned the room, the mood seemed positive except for the professional services manager who had expressed doubts to her in their one-on-one session last week. She thought she had won him over by adding a resource for his group in the proposal, however, today, his body language was closed, he was looking down, and his lips were pursed. She made a mental note to expect some challenging questions from him. As the presentation portion closed, the CEO asked if there were questions. A number of the managers offered their support of the idea, and there were a few softball questions on timing and risks. The mood of the room changed in a blink of an eye and Beth struggled internally for a second with the aggressiveness of the objection. She could feel her neck and shoulders immediately tense up. Her natural inclination was to fight back—after all, she had worked too hard on this program to let it fail right here. She also understood a verbal fight in this setting was a losing proposition. She needed to reboot and secure the high ground. 1. Manage yourself in challenging confrontations. You cannot spend time in the workplace without walking into a challenging confrontation of some type from time-to-time. Whether it’s a presentation setting such as the one Beth faced in the narrative or a problematic feedback conversation, the landmines are everywhere. Great workplace communicators understand these challenging confrontations are won or lost based on their response in the moment. They work hard at maintaining the presence of mind and not allowing the threat center of their brain—the amygdala—to overwhelm the much weaker but critical executive control center. They know how to create an internal reset and engage intelligently, not emotionally. I anticipated that from him. It’s interesting that he didn’t take this aggressive of a tone in person. I have to respond appropriately to this situation. After working through the above for a few brief seconds, she used a question to restart. The positive response and legitimate question allowed the entire room to relax. Beth was back in the game. While John didn’t have a great comeback for this, it opened up a flood of new questions on risks, and Beth deftly navigated those drawing upon her pre-session message mapping. Moments such as the one Beth is living through in the narrative are mission critical on your journey to career success. Get it right, and doors open in front of you. Muck it up, and you likely lose equity in the minds of many involved. And remember, someone must choose you to be successful. You do the heavy lifting, but someone else gets the vote. Beth and other great workplace communicators work tirelessly on developing the right story backed by the correct examples and evidence. They pre-test their storylines and they stress test their logic. And by the time they are ready for prime time with their proposal or pitch, they’ve won because of their preparation. Beth used my technique of message mapping (described here in: The Career Enhancing Benefits of Message Mapping) to develop a simple, clear core storyline, strong supporting examples, and fact-based evidence. After ample stress testing and practice with the message map, she drew upon it to create and deliver her presentation, and importantly, field those challenging questions. After fielding the questions drawing upon her message map, the CEO suggested a one-week delay on the vote while Beth and the resisting manager worked through their disagreement. Beth took this as a victory—after all, it was one step closer to approval—and she began to focus on her next communication challenge. The day after the meeting, she sat down with the resisting manager, John, to better understand his concerns and hopefully find a way forward. Before the session, she had done some background exploration and learned that John ran a tight ship for client service delivery and was critically concerned about both bandwidth and quality. He had a bad experience last year with a new program that didn’t work out in the market, and according to colleagues, he believed he had been blamed unjustly for the failures of a poorly thought-out plan. His mood ever since was a firm “No” to anything that might create this same backlash. Beth knew this program was well conceived and carefully thought through. However, she recognized a logical pitch was going to fall on deaf ears. The real issues were emotional. Beth understood The Persuasion Cycle, popularized by communication expert, Dr. Mark Goulston. The cycle suggests that people must move from resisting to listening to considering to doing to glad they did in steps, and it’s imperative to appeal to emotions to help them walk through the steps. Beth used a number of the tools of positive persuasion (See my article: 11 Principles of Positive Persuasion for Workplace Conversations) to melt John’s resistance and begin to move him through the process. John, it must be tough to be you in your position, where you have to ensure quality yet people continuously want to throw new programs at you. Help me learn how I can help you avoid situations like the one last year. Are you willing to show me how a properly structured program can prevent a repeat of that situation? If you could mitigate all of those risks, would you be open to discussing a new program? Under what circumstances would you be agreeable to this program? If you own the implementation and I effectively report to you for this project, would you be agreeable? Beth showed genuine empathy, positioned herself as a willing student, and ceded control strategically to John. Ultimately, he defined the conditions necessary for him to be on board. She agreed, and they both presented their revised idea at the next executive meeting. The program was a hit with clients and became a significant revenue producer as the sales team jumped on board. John and Beth have a great working relationship. The bottom line for now: Work hard to prepare and hone your messages, but don’t be surprised when some individuals refuse to jump on board with your ideas. 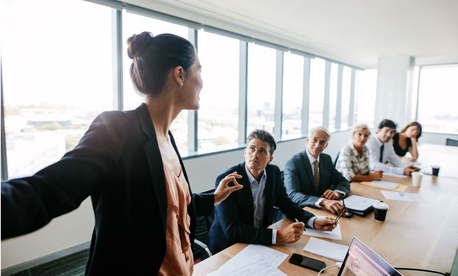 Responding to objections or disagreements with an increasingly aggressive communication style usually succeeds in doing just one thing: strengthening their resistance. Learn to control yourself in the moment and importantly, recognize that people make decisions based on emotions more than logic. Learn to tie these three together—own your message, manage yourself in the moment, and practice positive persuasion—and you have a bright communication future in front of you.